Our Executive Presence Model is designed to facilitate objective discussions around a subject that tends to be highly subjective. We often talk about executive presence, gravitas or charisma with reference to those who seem to possess a set of characteristics that legitimise their place in the board room or within the senior leadership community. There is something about them that makes them seem ‘right’ for an executive position. We created the model by drawing on our experience as senior leaders in organisations and by researching the content with successful executives through our work in executive coaching and talent development. Our model will help individuals reflect on their own presence/impact. It works as a coaching/development tool that helps to explain and explore this subject in a safe and constructive environment. 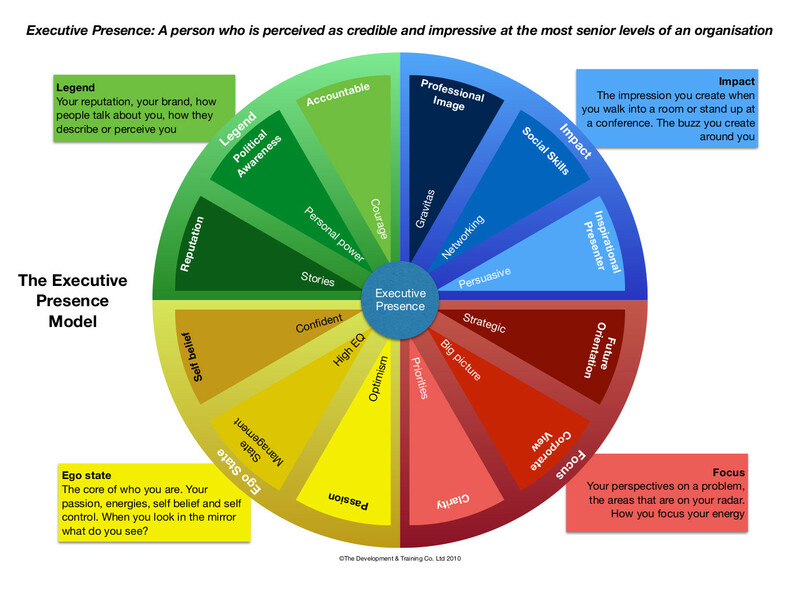 This tool can also be used to help you have an objective discussion about high potential individuals and their development needs. We wrote the model, tested it and have used in in hundreds of coaching sessions and workshops. It is in development as an app for the iPad. We developed this as a result of working with and coaching executives from across many industry sectors. 200 coaching professionals helped to shape and and fine tune it. Ageas run a comprehensive talent development programme. The participants are all seen as high potentials. They asked us to put together a workshop looking at building executive presence to help them understand what it takes to perform at the highest level. The programme was a great success and is now a core part of the Ageas learning and development programme.